Rectory Musings: The Word as a Wordle... with a difference! Instead of this Sunday's readings Wordled... 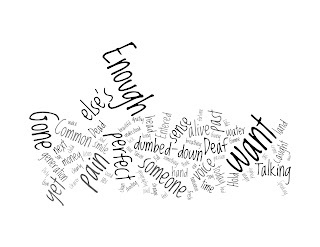 I enclose a Wordle of a song called 'A Voice From The Past' by my fave band Marillion. The words move me and speak politically right into the demands for action by those with the power for action on global poverty and climate change. A voice now past. A beautiful soul. Words by Steve Hogarth that echo the sentiments of the Jubilee 2000, Drop the Debt, Stand Up, 10:10 and countless other campaigns... As a Christian my desire to act is one driven by a God-given cry for justice. We cannot sit on our hands.